Blackwell Handbook of Language Socialization is here! 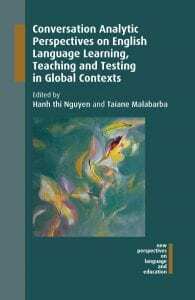 The Handbook of Language Socialization is out. Edited by Sandro Duranti, Elinor Ochs, and Bambi Schieffelin, this volume is the 37thin the prestigious Blackwell Handbooks in Linguistics series. In chapter 9, ‘Language socialization and repetition’, I discuss patterns in and insights from language socialization research that has taken repetition as an analytic focus. I examine 4 practices of repetition – revoicing, prompting, guided repetition, and language play. I then discuss repetition-related findings from studies conducted in contexts of second language socialization and religious socialization. I conclude with a discussion of how attention to repetition in socializing interactions expands and enriches our understanding of the nature of communicative competence, its development over time and across texts and contexts, and the active and sometimes transformative role of the novice in socialization processes. A new article of mine, “Moving across languages, literacies, and schooling traditions”, has just come out in Language Arts, part of a special issue ‘Remaking Literacies across Time and Place’. Click here for contents of the issue. In this article I draw upon my research in the Maroua Fulbe community in northern Cameroon and in the Somali immigrant-refugee community in Columbus to provide insights into the schooling and literacy experiences Somali children and other Muslim immigrants may bring to public school from their other school. I first discuss Qur’anic schooling in the Fulbe community, describing the organization and the significance of this schooling tradition for participants, as well as the recent rise of double schooling and changes in Islamic educational practice. I then shift my focus to the Somali immigrant-refugee community in Columbus, discussing changes in Qur’anic schooling that have arisen in this diasporic context. After discussing how Qur’anic school experiences may affect Muslim language-minority children’s second language and literacy learning in public school, I conclude with reflections on how knowledge of Qur’anic schooling and Qur’anic school-based literacies might impact the practices of public elementary school educators. In response to frequent requests for a stand-alone soft-cover version of the language socialization volume (number 8 of 10) of the Encyclopedia of Language and Education (2nd edition, 2008), Springer has just published a new 2010 paperback version called Language Socialization that can be purchased separately. The publishers were convinced to do this in part because of the number of downloads generated by the online chapters. My research is featured in Nick Evan’s new book on endangered languages and language documentation. Read the excerpt from Chapter 1 and check out Dying Words: Endangered Languages and What They Have to Tell Us (2009, Wiley-Blackwell). A new article of mine, ‘On communicative competence…in the field’, is now available on the website of Language & Communication. For many linguistic anthropologists, fieldwork entails working with and in a language or languages we do not master. However, little has been written on field language communicative competence, the development thereof, or the influence it has on the research questions we ask and how we answer them. I describe ways in which I addressed research challenges posed by limited field language competence, developed communicative competence while engaged in research, and made the two endeavors mutually enriching. I call for further discussion of field language communicative competence and our repertoire of practices for managing and improving limited field language while in the field. The article will appear later this year in a special issue ‘Reflections on language and culture fieldwork in the early 21st century’, edited by Suzanne Wertheim and Jocelyn Ahlers. An article of mine, Body, text, and talk in Maroua Fulbe Qur’anic schooling, has appeared in Text & Talk. It is part of a special issue, The spirit of reading: practices of reading sacred texts, edited by Laura Sterponi, UC Berkeley. In this article, I present a language socialization approach to the study of Qur’anic schooling. Integrating insights from holistic study of the community and the institution, analysis of video recordings of Qur’anic school interaction, and video playback and interviews with community members, I describe the apprenticeship of Fulbe children into Qur’anic orality and literacy as a gradual transfer of responsibility for rendering the sacred text. I conclude by discussing how the language socialization perspective and attention to multiple modalities increase our understanding of Qur’anic schooling as an activity setting in which Muslim subjectivities come into being.